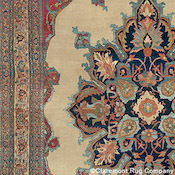 View a selection of Laver Kirman antique rugs now available for sale. The weaving center of Kirman in central Persia has been an esteemed carpet producer of court-inspired designs since the royal patronage of the Safavid dynasty over 400 years ago, on a par with Tabriz and Kashan in esteem. 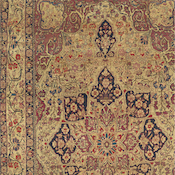 In 2010, a 17th century Safavid Kirman sold at auction for $9.6 million – over twice the highest price ever paid previously for an Oriental rug. Located in the great desert of Southern Persia, Kirman has been an important trading and weaving center even before the time of Marco Polo. 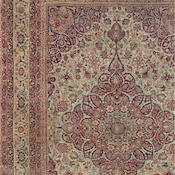 Kirman carpets were some of the first antique Persian rugs to make their way to the west, where they were eagerly sought out in Europe and, starting in the late 19th century, among the industrialists of the American Northeast. The Persian carpet weavers of the Kirman region, in turn, were influenced by European culture and from the 16th century developed a soft, graceful style that combines elements of classic Persian court carpets with the colors and designs found in French textiles. In the early 19th century during a period of civil strife, the city of Kirman was sacked and burned. Escaping the destruction, many of the most skilled Kirman carpet weavers escaped to the village of Laver, north of Kirman where they reset their looms. The weavers of Laver created unusually finely woven and delicate pieces using a silky wool on a cotton foundation. 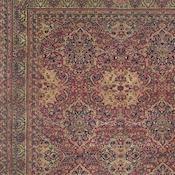 The finest antique Kirman carpets became known as ‘Laver Kirmans’. 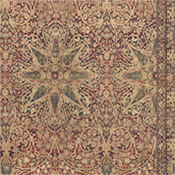 Laver Kirman antique rugs possess a complexity of design and subtlety which is unique in Persian weaving. The drawing of the designs in the best antique carpets is fluid and lyrical with floral motifs of almost infinite detail. Their pattern language is frequently comprised of all-over patterns of botanical motifs or a central medallion encircled by dense foliage. The small-scale patterns and soft flowing lines of flowerheads and vinery were possible because of their fine weave and the outstanding quality of the wool. 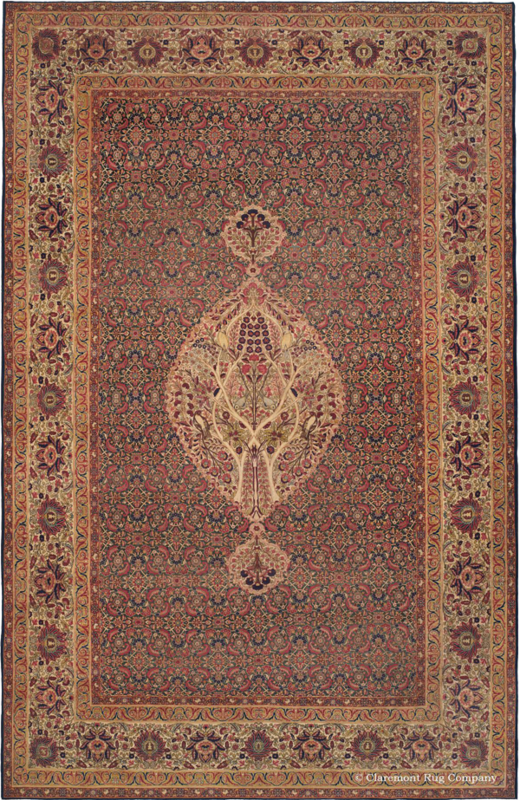 The pile of Laver antique carpets was cut very thin to accentuate the workmanship, giving the finest antique Kirman rugs a fabric-like handle. The color palette of Laver Kirman antique Persian rugs is unusually soft and delicate with a European grace. 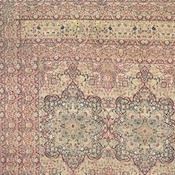 The finest antique Laver Kirman carpets offer quintessential refinement and romance. Ivory and sand-toned grounds (seldom-found in other styles of 19th-century Persian carpets) predominate, enhancing the ethereality that is the hallmark of this Persian city carpet style. The weavers had access to the prized and extremely expensive cochineal dye which yielded the rich Renaissance reds found in antique Kirman carpets, rather than the rust red found in other antique Persian rugs. 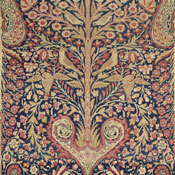 The use of soft gold and yellows juxtaposed against small areas of deep, almost black indigo dyes as well as a range of soft pinks, greens, and blues give Laver Kirman antique Oriental rugs their unique and popular color palette. An antique best-of-the-best Laver Kirman carpet can be recognized by a number of traits that distinguish it from the typical esteemed Laver Kirman. Most notable are its extraordinary fine weave and extremely closely shorn pile. As well, they present exquisite detail work, with the edges of the designs having a chiseled effect.  Finally, many best-of-the-best carpets employed a fine grade of lamb’s wool, rather than the sheep’s wool used in the vast majority of antique carpets. This gives their surface a particularly magical luster. The province and city of Kirman in Central Persia continued to make extraordinary carpets throughout the 19th century and turn of the 20th century. Satellite workshops were set up in Kermanshah in Western Persia, where densely patterned carpets with deep ruby or burgundy fields were usually produced. 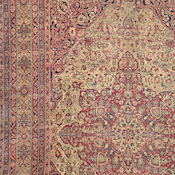 The term “Laver Kirman”, while alluding to an actual town, is used in the antique rug market almost exclusively to denote the finest qualities of Kirman rugs. 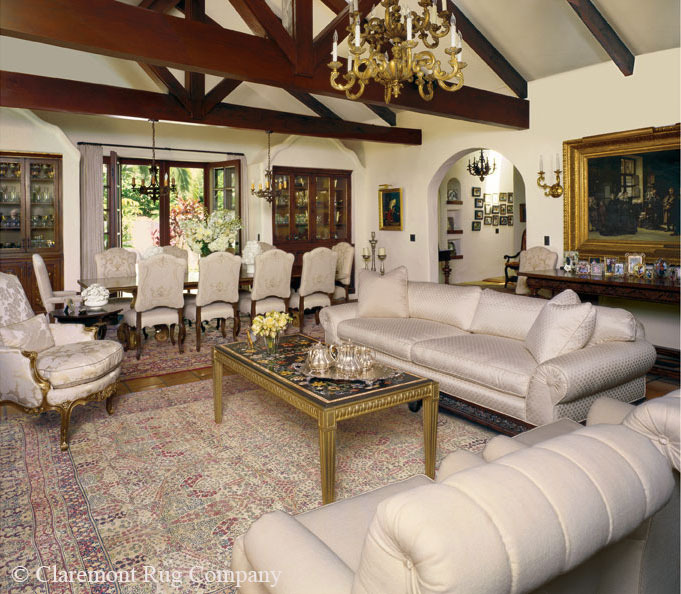 The turn-of-the-20th-century Laver Kirman and 19th-century antique Laver Kirman carpets are seldom-found in today’s market, and are highly sought out by connoisseurs and collectors in Europe and America for their stunning artistic impact. 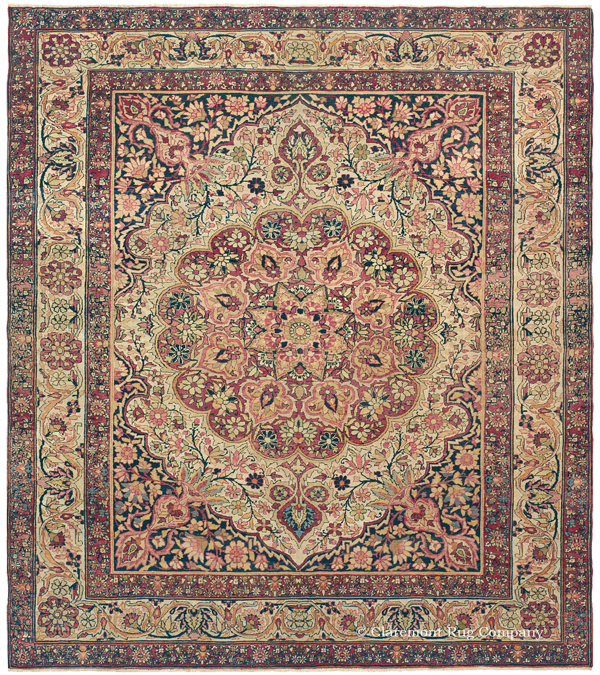 Laver Kirman antique carpets are most usually found in the room size (usually 8ft x 11ft to 10ft x 14ft), or area size (typically 4ft x 6ft to 4ft 6in x 7ft) formats. Only occasionally are they seen in the oversize or palace size format, and unfortunately, runners and keleges (corridor carpets) are virtually never available. They have been traditionally superb art investments, a trend which is now strengthening as highly artistic, antique examples in good condition have become increasingly difficult to find.